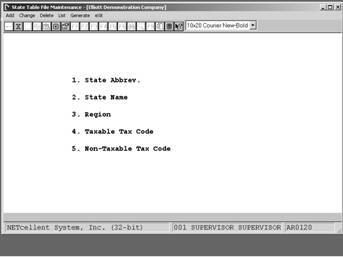 The purpose of this program is ensure correct state abbreviations for address and shipping accuracy. For example, is Alaska AL or AK? Is Montana MO or MT? The system comes with a pre-defined table of all 50 states and their abbreviations. All you need to do is click the Generate menu button and the system updates Fields 1 and 2 for all state abbreviations and name. Field 3: Optional sort field for sales reports and custom reports using Crystal Report Writer. NOTE Fields 4 and 5 are used the ZIP Tax Code Program to auto-assign up tax codes by ZIP Code.